This small two-seater is powered by a 1.7-liter single-cylinder engine pushing out all of 10 horsepower. It was discovered in Turkey, of all places, and brought back to the UK and restored for museum duty. Only a handful of these cars remain. Bizarrely, Mr. Adams died aboard the Lusitania (not the Titanic as mentioned in the catalog), much like the founder of the Trumbull cyclecar that is being sold from this same collection. It’s either a weird coincidence, or this collector has, um, very morbid tastes. Look for a price between $20,000-$26,000. Click here for more info and here for more from this sale. 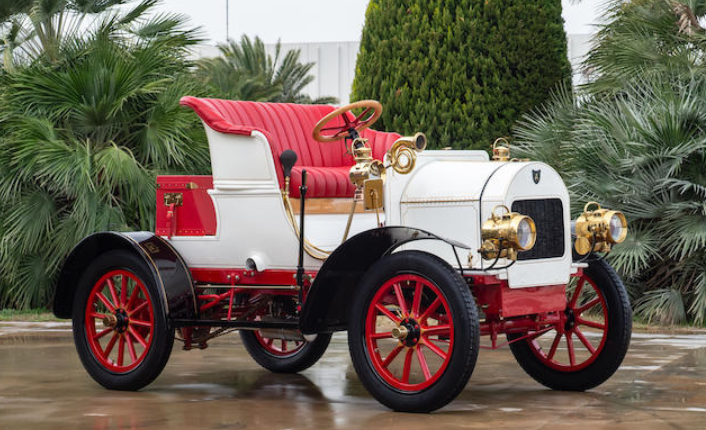 This entry was posted in Uncategorized and tagged 10hp, 1907, adams, auctions, Bonhams, cars, classic cars, two-seater by classiccarweekly. Bookmark the permalink.